How Much Control Do Pitchers Exert Over Exit Velocity? When it comes to batted-ball exit velocity, its a lot easier to write about hitters. It’s become fairly clear that hitting the ball hard is a skill, and that the numbers are mostly consistent from year to year. When it comes to pitching, however, things are much less clear. Given the outcomes for individual batted balls based on exit velocity — even in the absence of the complementary launch angles — suppressing exit velocity appears to be a benefit for pitchers. Given how much control hitters exert over exit velocity, it stands to reason that pitchers have considerably less control. Whether they have any control at all is something we can begin to determine by looking at Baseball Savant’s full-season data from 2015 and 2016. First, let’s take a quick look at the relationship between exit velocity and ERA and FIP compared to a few other stats: K/9, BB/9, HR/9, and BABIP. I took a look at the 93 pitchers who recorded at least 100 innings in both 2015 and 2016 for comparison. The chart below shows the r-squared figures between the single-season stats for ERA and FIP with the stats mentioned above. The higher the number, the stronger the relationship. As we might expect, strikeouts, walks, and homers all have a pretty strong relationship with FIP. Those, of course, are the three variables used to calculate FIP. BABIP has zero relationship with FIP, which isn’t surprising, given that FIP purposefully excludes balls in play. Exit velocity doesn’t have an incredibly strong relationship with FIP, but it does seem like one exists. On the ERA side, exit velocity has the same r-squared as in FIP, but BABIP becomes more of a factor for ERA, bringing homers down some, walks down a little, and strikeouts down to close to the same relationship on ERA as a pitcher’s average exit velocity. While it might seem as though we have a relationship between exit velocity and ERA and FIP, that information will have its limitations if the data doesn’t remain steady from year to year. For example, we know that BABIP factors in to ERA, but predicting BABIP is incredibly difficult — if not impossible. 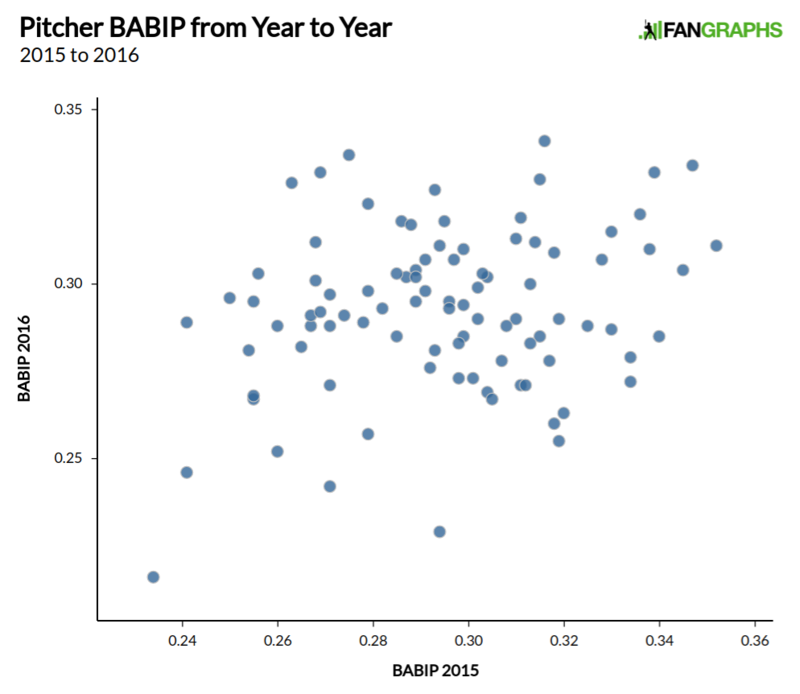 Here’s a graph of the 93 pitchers I studied, plotting their BABIP from 2015 against their BABIP from 2016. There isn’t much of a relationship there to see (r^2=.06), and if you had guessed 2016 BABIP by using 2015 BABIP, you would have missed by 25 points per pitcher on average, roughly one standard deviation. If you had just guessed .300 for all the pitchers, you would have been off by an average of .019. The relationship between average exit velocity and BABIP is basically non-existent. If you look at a pitcher who’s recorded a low ERA relative to his FIP, and you wish to justify that difference, you might see a low BABIP and wonder how that came to be. It might be tempting to cite the pitcher’s low average velocity (if, indeed, it is low), but that relationship might not exist. The r-squared between exit velocity and BABIP for the 186 single seasons in question is .04. If you combine the data for 2015 and 2016, the relationship is even less apparent. While pitchers with low average exit velocities have averaged low BABIPs over the past two years, the same is actually true for pitchers with high exit velocities, as well. It’s possible that low exit velocities combined with a good defense might make it easier for a pitcher to sport a low BABIP, but the same could be said for high exit velocities and a good defense. There are ways to justify a low BABIP using Statcast and claim it is due to weak contact — and it’s possible that adjusting for factors like defense can get you closer to a “deserved” BABIP, but average exit velocity is probably not one of those ways. Before we get to exit velocity, let’s look at the sort of stronger relationship present in strikeout rate. Here’s strikeouts from 2015 compared to 2016. Notice how much closer together everything looks and you can sort of form a line in your head that follows the plot points. The pattern for K/9 is much more linear. If you had guessed a pitcher’s 2016 K/9 based only on his 2015 number, you would have been off by 0.8 strikeouts, which is off by only a little over one-half of a standard deviation. 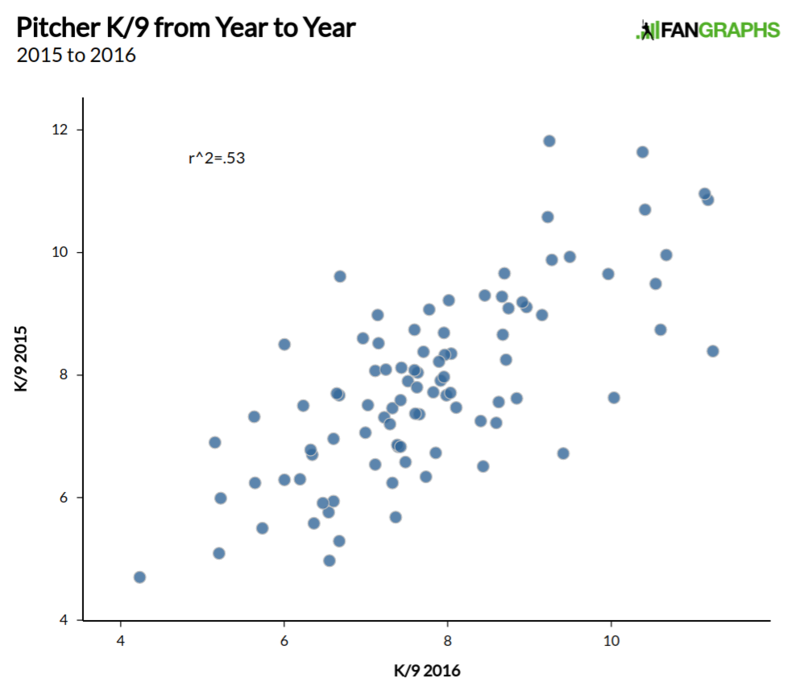 So if, when we look at exit velocity, it looks like K/9, then we will know we have a strong relationship. If it looks like the BABIP graph, we’ll know the relationship isn’t very strong. One last detour before we get to the exit-velocity graph. 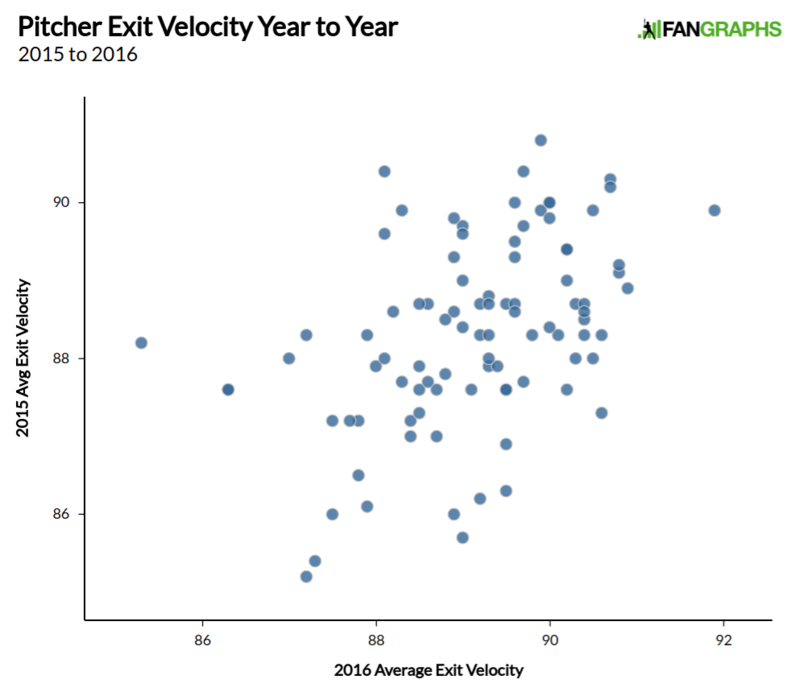 I should note that, for the pitchers studied, exit velocity went up, on average, about 0.8 mph from 2015 to 2016. While we could chalk this up to some sort of recording error or poorly calibrated machinery, it’s important to note that offense saw a pretty big increase from 2015 to 2016 and that, for the most part, this affected everyone. By way of example, that 0.8 increase in exit velocity was roughly two-thirds of one standard deviation. When we look at the exact same pitchers, we see that HR/9, having nothing to do with Statcast, went up by 0.2, which also happens to be roughly two-thirds of one standard deviation. On first glance, we find that the trend here isn’t as clearly defined as year-to-year strikeout rate, but that it’s also not nearly as random as BABIP. The r-squared for year-to-year exit velocity is .21, which is a far cry from strikeouts, and is pretty far behind walks (.37). However, we wouldn’t expect that strong of a relationship given how much control we know pitchers have over things like strikeouts and walks, and how much control we know hitters have over exit velocity. When you compare exit velocity to HR/9 (.07) or HR/FB (.02), exit velocity comes out ahead. The more variables we have involved, the less of a direct relationship we might expect to see. 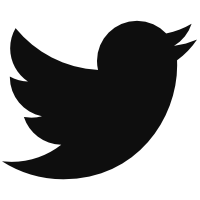 FIP, which considers three variables, has an r-squared for the above group at .28. That might not seem like much, but remember that HR/9 is not easy to predict from year to year, and that it has the strongest relationship with FIP of the three components. When we compare FIP to ERA, the year-to-year correlation is much stronger. ERA’s is weaker than exit velocity’s, at just .05 for r-squared. The relationship between 2015 FIP and 2016 ERA is stronger than the one between 2015 and 2016 ERA, which is a part of the reason why FIP is such a great stat to use: it’s more consistent and better predicts ERA from year to year. So we see some relationship year to year with exit velocity for pitchers, but we know it doesn’t help us solve any BABIP-related issues we might have. That doesn’t mean, however, that there aren’t other relationships worth exploring. In the middle of 2015, I took a look at the relationship on FIP, home runs, and exit velocity, and it’s probably time to run those number again. We hoped you liked reading How Much Control Do Pitchers Exert Over Exit Velocity? by Craig Edwards! B.) Allow an uncommonly high ratio of uncommonly high EV balls in play. Averaging out every BIP’s EV just masks the extreme events that are really the meat of a pitcher who does or does not generate much weak contact. I’d also bet that the year to year correlations on ratios of very weak and very hard contact per BIP for individual pitchers would be much higher than the averaged seasonal EV values. For example, my method of predicting future home runs using only statcast data and nothing else, my year to year correlation is .733 between 2015 and 2016. Predicting future wOBA is .610. I have a value hit metric (VH%) which is a type of hard hit ball and it has a year to year correlation of .639. VH% also correlates very well with wOBA. Predicting slugging is .596. Anyways, you can go read that table if you’re interested.